Over the many Markets we have run we have complied some interesting feedback from Stall holders & Market Patrons. We have complied a few pointers for you to have a think about when attending a Market to get the most out of your Market experience. Tell the world where your going to trade! We have clear marketing guidelines that we complete for each Market and do our best to get the most exposure for the event. Spreading the news that you will be attending the Market via Social Media costs nothing and any extra traffic you can pull in to the Market can only help your exposure on the day. Do a Mock Stall Set up at home. 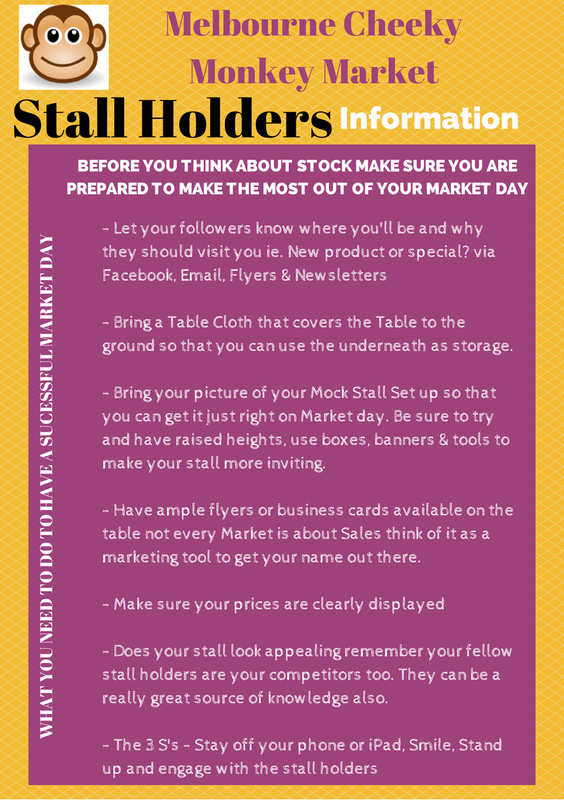 You may be an experienced Stall Holder this may be your first Market none the less Im sure your stock is constantly changing and evolving as to should your display. Think of the large Major stores, they don't keep their display the same week in week out just because it worked last week? To attract new buyers you nee to keep your set up fresh and inviting. Never set up your display without a table cloth ..... ever. Try different techniques such as fake grass? Hessian Bags, think outside the square. The same goes for display. Try painted crates on your trestle table to give extra height add depth and colour. The Cube shelving is also a great way to display your goods. Use a Mannequin? You can use tree branches? Use Vintage Suitcases, Clothes Racks the list ends when your imagination does too. Stand back and have a look at your stall from the customers eyes. A very difficult task indeed, ask yourself what is this stall selling? Who is my target market? Does my stall look inviting? Always make sure all of your stock is clearly priced. Shippers get scared to ask the price of items all to often, having it clearly marked avoids this and the potential loss of a sale. Use Sale signs, Balloons where permitted, Lights, Banners or Buntings even a vase of fresh flowers can brighten up your display. The key here is to think outside the box. Provide cards or flyers for customers to take not everyone can afford to shop on the spot they may like to order later. Upsell and cross sell. Did I hear I don't like sales? You weather you realise it or not are now in sales. When someone picks up a pair of earrings why not point out the matching necklace? Perhaps they may have picked up a baby bib and you have a matching dummy chain? There is a reason why Mcdonalds ask you if you want an apple pie with your order....It works. Stand up behind your stall. Its always the stall holder that has sat behind their stall playing candy crush or reading a book that doesn't do well at the market. Stand up when you can and make eye contact with your buyers you will be surprised the difference a bit of eye contact and more importantly a smile can make. Remember that not every Market is going to be a successful one for you. Rather than beating yourself down about it think of it as a marketing opportunity. The cost you pay for a Market stall is comparatively cheap in comparison to what you would pay for other forms of marketing. Often meeting customer's first hand is more constructive than a bunch of words in a newspaper or online. Remember that not everyone can afford to purchase on the day, that's why having a specials database or newsletter sign up at your stall is a great way to collect data to contact clients later. Regular Markets are a great way to build trust in your customers and these often become loyal followers. We now have a regular monthly Market in the same location that is available via our bookings page. While you are in competition with all of the other stall holders at the event, they too can become great life long friends with valuable knowledge on what works for them and what doesn't. Why not change it up and give some of their tips a try? If you take on nothing at all please remember that If you enjoy yourself so too will your fellow stall holders and then that will follow through onto your customers. Good Luck on Market Day and please remember we are always there to lend a hand if you need to pop to the loo, grab some lunch or need advise on set up etc. Don't be afraid to ask we are more than happy to help.